We have discovered a new bright radio transient in M82. 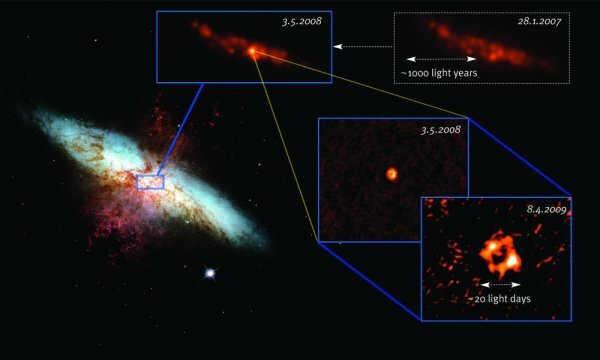 Using the Very Large Array, we observed the nuclear region of M82 at several epochs at 22 GHz and detected a new bright radio source in this galaxy's central region. We find a flux density for this flaring source that is ~300 times larger than upper limits determined in previous observations. The flare must have started between 2007 October 29 and 2008 March 24. Over the last year, the flux density of this new source has decreased from ~100 mJy to ~11 mJy. The lightcurve (based on only three data points) can be fitted better with an exponential decay than with a power law. Based on the current data we cannot identify the nature of this transient source. However, a new radio supernova seems to be the most natural explanation. With it's flux density of more than 100 mJy, it is at least 1.5 times brighter than SN1993J in M81 at the peak of its lightcurve at 22 GHz. VLBI observations of this radio transient showed then a shell like structure expanding with a velocity of ~21,000 km/s. See also press release in English and German (2009 May 27).